Who loves lasagna? I do! You know what I don’t love though, it takes forever to make! So many steps, all the layering, and then all that time baking in the oven. On top of the lengthy time spent making it I always feel like I need to have a huge piece since I put all that work into it. Of course we all know how we feel after a huge piece of lasagna….like a giant balloon about to pop. Well friends, I’m here to tell you that I have come up with a solution to both of those problems, Mini Turkey Lasagna Cups! 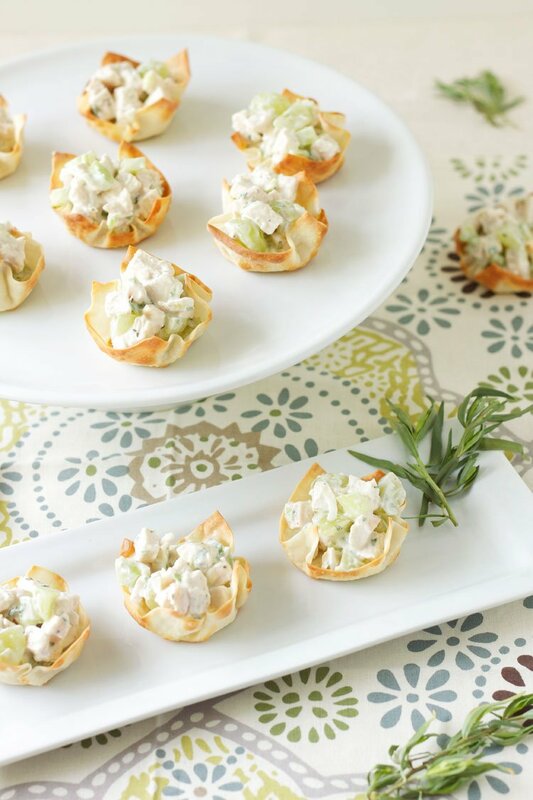 Lets start with the key ingredient that makes these mini turkey lasagna cups so easy to make, wonton wrappers! Have you ever used wonton wrappers before? They are amazing! They make the perfect shell or cup for filling with all sorts of goodies. I’ve used them for tacos, chicken salad, and now lasagna. I have to say the lasagna may be my favorite! 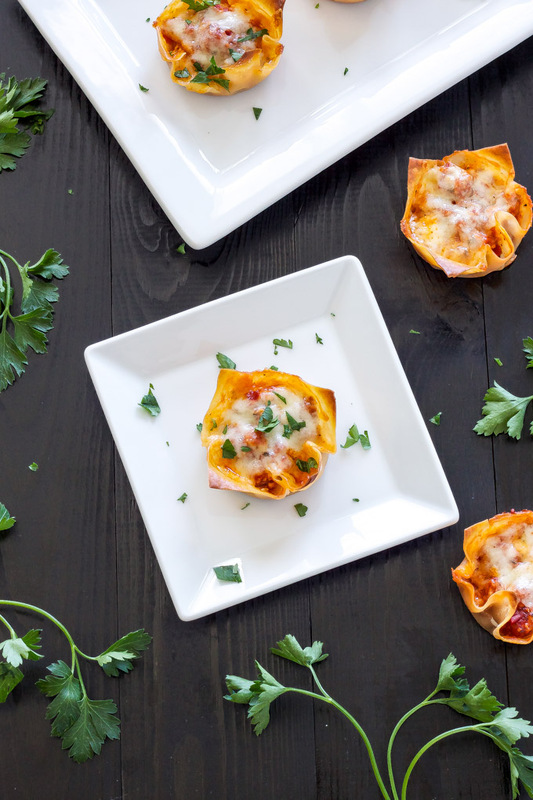 These turkey lasagna cups are so easy to make you could even get the kids involved. To make them start by browning lean ground turkey in a skillet and season it with some salt and pepper. Once the meat is browned put it in a large bowl and add in a couple cups of marinara sauce, stirring them together until combined. I always have a stash of my homemade Easy Marinara Sauce that I keep in the freezer for whenever I need it. 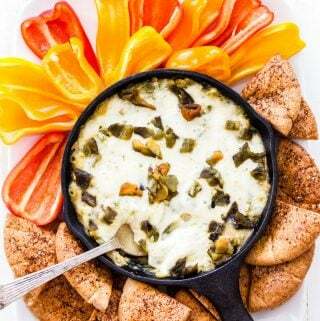 In a smaller bowl add in a 15 ounce container of part skim ricotta along with salt, pepper, garlic powder, dried basil, and parsley to flavor it. 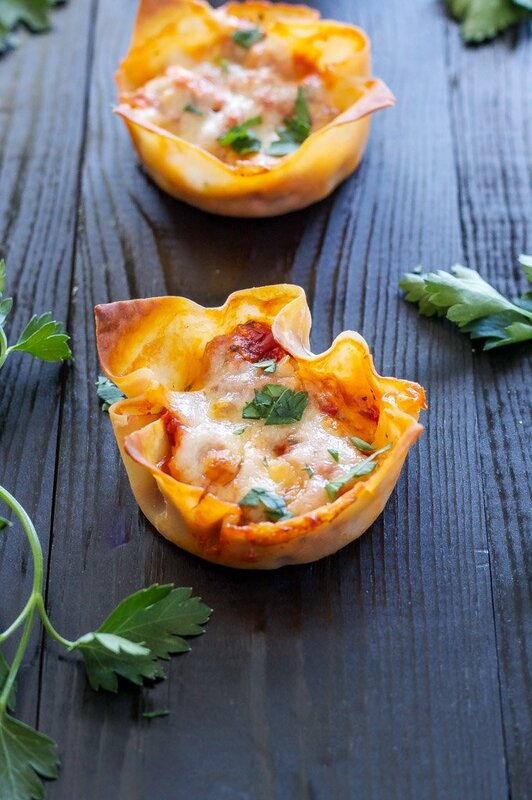 Grate some mozzarella cheese and now you are ready to assemble the lasagna cups. This recipe makes enough for 24 mini turkey lasagna cups. 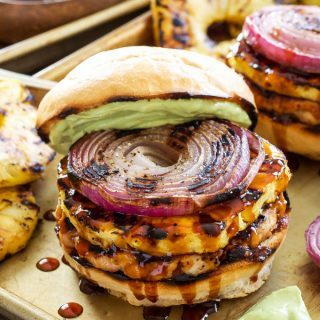 If that’s too many for you the recipe can easily be cut in half. To assemble the turkey lasagna cups, spray a standard 12 cup muffin tin with cooking spray. It’s very important to spray the tin or you’ll never get the mini lasagnas out. Next, take the wonton wrappers and press one of them down into each of the muffin cups. Take a teaspoon of the marinara turkey mixture and put it in the bottom of each wonton wrapper. Then take a teaspoon of the ricotta cheese and put it on top of the meat sauce. Top the ricotta with another teaspoon of meat sauce and a sprinkle of the shredded mozzarella cheese. 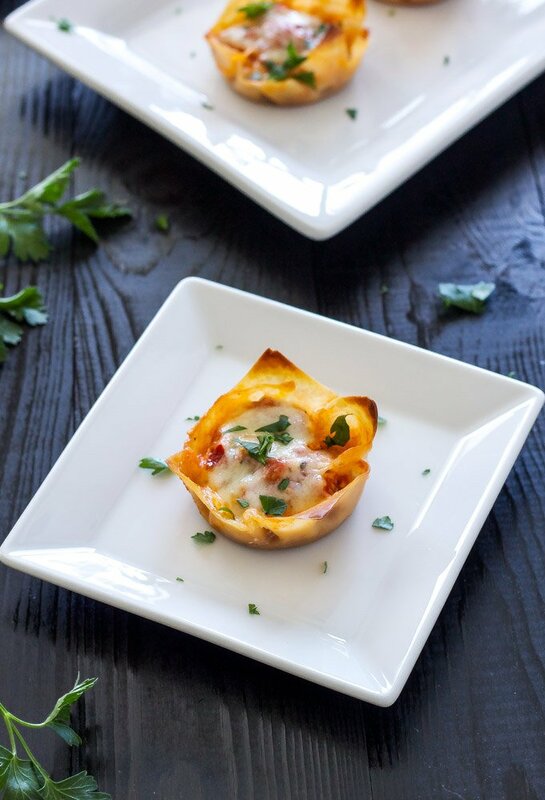 Bake the mini turkey lasagna cups for 15-20 minutes and that’s all there is to it! 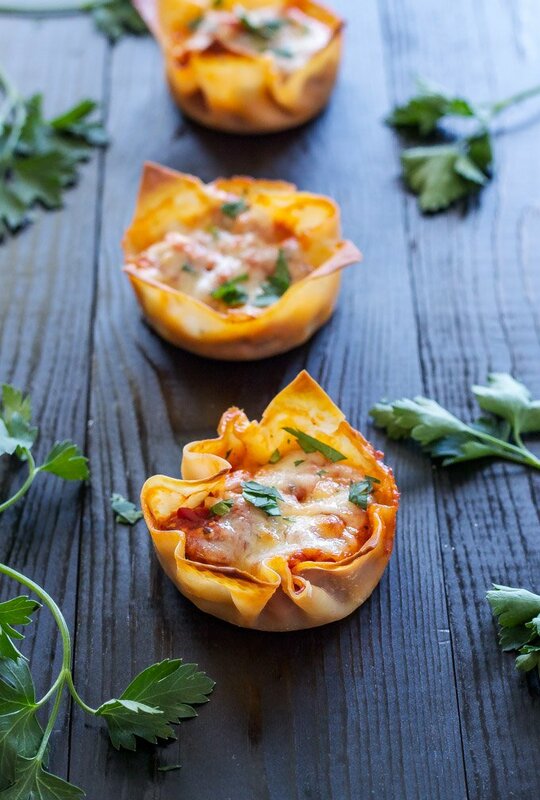 Perfectly sized lasagna cups that only took about a 1/4 of the time to make and bake! Enjoy! 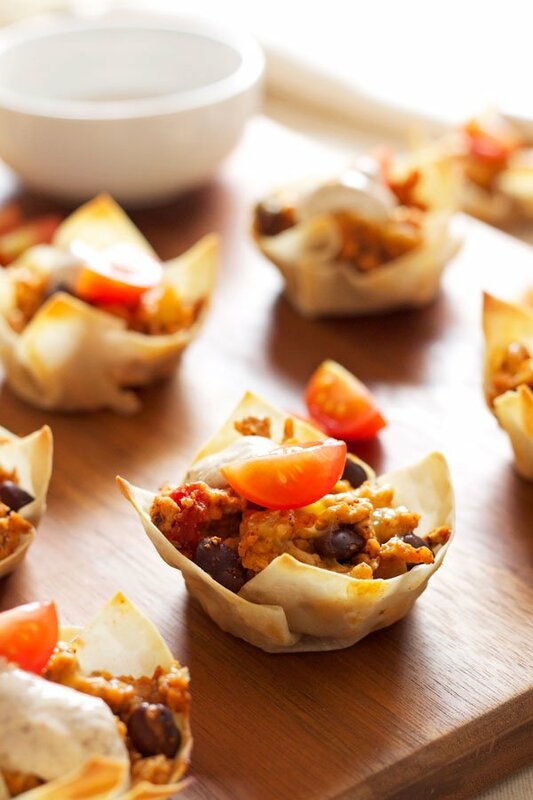 These individual mini turkey lasagna cups are easy to make and perfect for serving at your next party! Preheat oven to 375 degrees and spray 2 standard 12 cup muffin tins with cooking spray. In a large skillet brown the turkey and season it with salt and pepper. When the turkey is cooked through pour it into a large bowl and mix it together with the marinara sauce. In a smaller bowl stir together the ricotta cheese, salt, parsley, basil, black pepper, and garlic powder until thoroughly combined. Press one wonton wrapper into each muffin cup so that it forms a cup to hold the filling. Place a teaspoon of the meat sauce into the bottom of wonton wrapper. Add a teaspoon of the ricotta cheese mixture on top of the meat sauce. Add another teaspoon of meat sauce on top of the ricotta. Top with a sprinkling of shredded mozzarella cheese, then place them in the oven and bake for 15-20 minutes or until the cheese is melted and the edges of the wonton wrappers are golden brown. 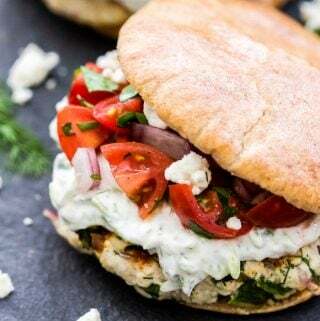 Top with chopped fresh flat leaf parsley if desired. These were absolutely fantastic!! I used my own sauce, but my family LOVED them! It makes enough for several batches so we're having it again tomorrow night! Many thanks! I'm so happy to hear you and your family loved them Juliet! Thank you so much for trying them out, I absolutely love them! Don't usually cook in the house, but these lasagna cups look interesting. Going to try them Saturday or Sunday. Wish me luck. Good luck Leeland! I'm sure you'll do great and I hope you like them! can these be frozen and then cooked? Always looking for handy meals to freeze. Hi Pam. I haven't tried freezing these, but I did a little research on similar recipes and it looks like others have had success doing so. My only concern is that the wonton cups won't be as crisp, but other than that it should work. I hope it works out for you and I'd be interested in hearing your results.